On the page to change the nameservers you will see that there are 3 checkboxes beneath the fields where you put your nameservers (see the next screenshot below). The first checkbox is titled “Make these default”. Selecting this option means whenever you register other domains, the nameservers you will have selected to be made default nameservers will always be used automatically. The second check box is titled “Update all domains”. Selecting this option will change the nameservers for all the domains under your account to use the name servers you will have specified in the nameservers field boxes. When you register a domain on Name.co.zw and do not change the name servers, your domain uses our default nameservers (ns.dc1.impressivehost.com and ns.dc2.impressivehost.com). When you use our default nameservers you are automatically enrolled for our instant nameserver updates option. This means when you change your nameservers and do not select the “Submit to registry” option your nameservers will be updated instantly and there is no need to wait for the Registry to change the name servers or wait for the propagation period. When you select the “Submit to registry” option, that means your name servers change request is sent to the respective registry. In this case, you will have to wait for the Registry to effect the changes and also allow time for the nameserver changes to propagate. Once you are done click on “Update” for the changes to be applied. N.B. Please note you are required to have at least two name servers with different IP addresses. If your domain is using our default nameservers, you can use the DNS records to point the domain to your host. To change the DNS records, click on the “DNS” button in front of your domain from within your Name.co.zw dashboard. This will take you to a page where you can update the DNS records. From the DNS page, you can update the A/AAAA records, MX records, CNAME records, TXT records, SRV records and set up the HTTP redirects. When you use our default nameservers you are automatically enrolled for our instant nameservers change feature. This feature allows instant nameserver updates, in case you are changing from one host to another, you will not need to wait for the Registry to make the nameserver changes. 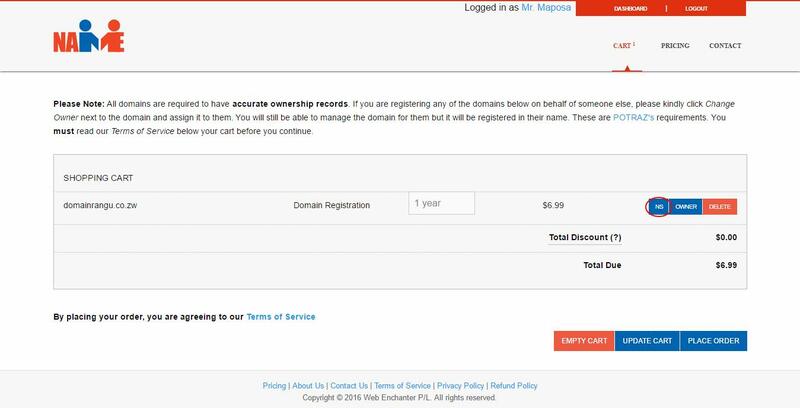 Since ZISPA deletes domains that do not have authoritative nameservers, using our default nameservers allows your domain to use our nameservers as authoritative before you sign up for a hosting account with the host of your choice.